What Kind of Bugs will Hurt Me in Texas? What kind of bugs and spiders do you need to look out for in the suburbs of Collin County? In a nutshell, the most medically dangerous are the brown recluse and black widow spiders, the tick, mosquitoes and Kissing Bug. Other nuisance critters include fire ants, chiggers,redheaded centipede, scorpions, wasps and bees. The information provided here does not replace medical advice and is local to Collin County, Texas. Don't let this information scare you, but rather take the proper precautions to limit your chances of being bitten. Click on the type of spider for detailed information on the habitat, bite, and scientific details. If you are bitten by any of these spiders, seek medical attention immediately. If safe to do so, capture the spider and take it with you to the emergency room. How to Tell if a Spider is NOT a Brown Recluse. Experts advise that you do not swat this spider if you find him on you, but rather quickly brush him off. The fang of the Brown Recluse are small and designed to penetrate insects. Thus, they must be pressed against you to bite. That's why it's a good idea to check your bed before climbing in as well as shake out your clothing and check your shoes before putting them on. Where am I likely to run across a Brown Recluse Spider? 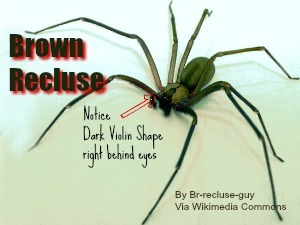 The Brown Recluse Spider prefers to live in areas that are least disturbed (hence its name). Around the house it prefers dry hideouts that are not disturbed for a few days such as cardboard, shoes, behind pictures, or in clothes piled on the floor. It also likes closets, garages, attics, crawl spaces, wood piles, sheds--any where it can get away from humans. Best avoidance tip: avoid clutter! Tape closed boxes stored in any of the places mentioned above. Source: Texas A&M AgriLife Extension) Michael E. Merchant, Professor and Extension Urban Entomologist with Texas A&M AgriLife Extension Service states, "Brown recluse spiders are present in Collin County, but not common in homes." While the female is often shiny black with a large abdomen and the tell-tale red hourglass on her underside, this isn't always the case; sometimes she doesn't have any markings at all. The male is much smaller, almost similar in appearance (at first glance) to the Brown Recluse. Where am I likely to run across a Black Widow Spider? These spiders hang out in garages, sheds, under trash can handles, in homes that have been undisturbed, wood piles, shrubbery, crawl spaces, gutters, utility meters and other places that are sheltered but open to the outdoors. This author has observed them under trash can handles, at the corners of garage doors, on porches, and in spec homes in corners. They build messy, sticky webs. 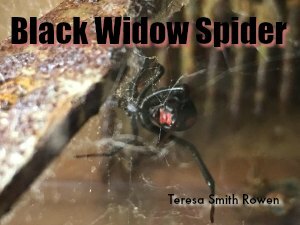 Professor Merchant advises, "Black widow spiders are mostly reclusive and cause relatively few human bite cases, but they are not uncommon and they are potentially dangerous." These blood-feeding insects appear similar to other bugs, but they are quite different in that they are the only bug that carries Chagas Disease--a disease that rarely affects humans but is more common in dogs. These insects gorge themselves for nearly fifteen minutes without the victim being aware. These are not venomous bugs; rather, the victim may be infected with a parasite in the bug's feces if it makes contact with the bite area. 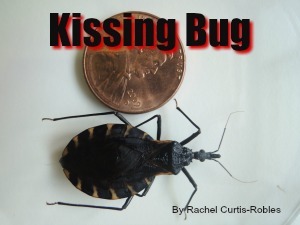 So, don't squash a Kissing Bug if you find him biting you! Eventually the victim may experience symptoms similar to a flu virus. Some victims develop chronic health complications including cardiac and intestinal complications. Where am I likely to run across a Kissing Bug? These bugs thrive near dog kennels. They also reside under porches, in outdoor dog kennels, chicken coops, under rocks, under cement, under bark and in brush piles. According to Professor Merchant "Kissing bugs are rare and not likely to be found indoors in our area." He adds that he's only had a few verifiable calls from Collin County over the past 27 years. 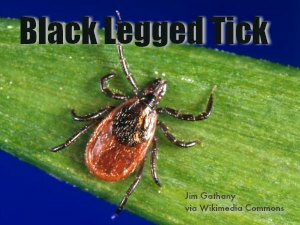 There are two types of ticks in Collin County that carry Lyme and other disease to humans: The Lone Star Tick and the Black Legged Tick. Source: Texas Department of State Health Services. While the tick and Lyme Disease is medically significant, there have only been an estimated 352 cases of Lyme Disease in Collin County between the years 1992-2011. Source: Tick Testing Services. 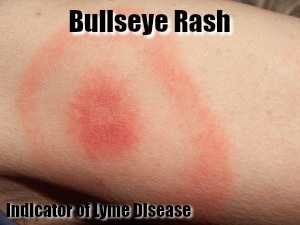 In about 80% of victims, a bulls-eye rash appears within 3-30 days of being bitten. The person may or may not also experience additional symptoms such as headache, fever, chills, fatigue, swollen glands, muscle or joint aches. With early antibiotic medical treatment, long-term effects of the disease may be prevented. Source: Collin County Pediatrics. To avoid ticks: if you know you'll be in tick habitat, wear long pants and tuck them into your boots or socks. Button your collar and long-sleeved cuffs. Don't sit directly on the ground. Repellents containing DEET work well to protect against ticks. Remove your clothing when you return home, launder before next use, and take a shower. Where am I likely to run across a tick? Ticks prefer to live in shaded, moist areas. Avoid brushing up against trees, tall grass and brush, and consider using an insect repellent with no more than 30% DEET. Check for ticks on your clothes, body and in your hair after being in these areas. 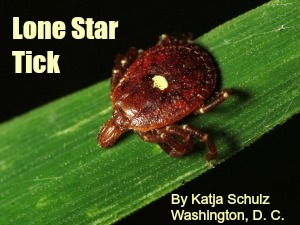 For detailed information, including how to remove a tick, click here and "View Full Article." The Texas Department of State Health Services has also specified fleas, lice and mites and disease-carrying pests. As these are typical to most states, we will simply provide a link to the information here. Basic household cleaning and personal hygiene practices should be enough to prevent an encounter with these pests. Technically, scorpions sting but do not bite. Unless you are allergic to their poison, the sting shouldn't be more than a nuisance. If you have any concerns, of course call you doctor. "Scorpions have stings similar to a bee sting in pain,... stings are not very common," states Professor Merchant. 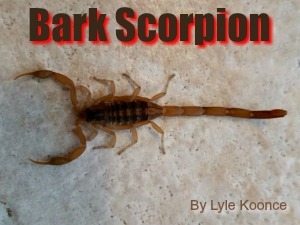 Collin County has one type of scorpion: the Striped Back Scorpion. Where am I likely to run across a Scorpion? Have you ever walked outside in the grass only to feel itchy--and later discover red bites? The cause may very well be chiggers. In the larvae stage, these little parasites crawl around on the human body looking for a great place to feed (bite). They typically get "stuck" where clothing is tightest, at waistbands, under socks at the ankles and near the groin. For more details and answer to the question, "do chiggers burrow into the skin?" check out the link above. 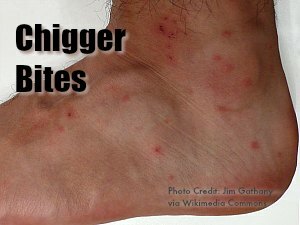 Avoiding chiggers is much like avoiding ticks: if you know you'll be in chigger territory, wear long pants and tuck them into your boots or socks. Button your collar and long-sleeved cuffs. Don't sit directly on the ground. Repellents containing DEET work well to protect against chiggers. Remove your clothing when you return home, launder before next use, and take a shower. Where am I likely to run across chiggers? Typically tall grass and brush, but potentially short grass if the development is fairly new. Chiggers may also be found in moist areas and on rotten logs. Professor Merchant warns, "fire ants would be the number one venomous pest that homeowners should be aware of in Collin County." The most frustrating thing about fire ants is that you may not be aware they have crawled upon you until they all sting you--which they do in unison. This author has been stung on several occasions after examining the grassy area where standing or sitting, only to discover too late that they had made their way onto my feet. Thus, I no longer stand still in one spot in the grass. The best way to avoid being bitten by fire ants is to check around the area you are walking, don't stand in one place for long on the grass, and don't destroy their ant hill--unless you're ready to quickly move out of the way. Where am I likely to be bitten by fire ants? The ants build their colonies underground, bringing the dirt up to make room for their colony. Look out for mounds on the grass and if you see one, presume they are nearby (as well as in the mound). The mounds may be visible in sidewalk cracks, along the edge of sidewalks, in flower beds, at the base of trees, and in grass. Tip: Avoid kicking a large ant hill. The venom here is actually in the spikes (or "hair") of this caterpillar. The pain, as reported by a physician, hurts more than that of a jelly fish, bee, or scorpion. Symptoms may also include headache, nausea, vomiting, and inflammation of the lymph nodes. This caterpillar varies in size and shape, so it is best to advise children not to pick up or touch any fuzzy, hairy or woolly insect. Professor Merchant shares that we do have a few stings from the puss moth caterpillar each year, which locals refer to as "asps". 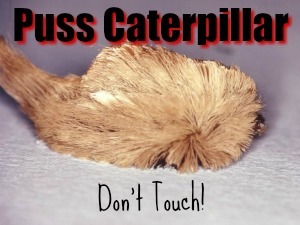 Where am I likely to find a puss caterpillar? They can be found on playground equipment that hasn't been used for a while, on trees and in the garden. 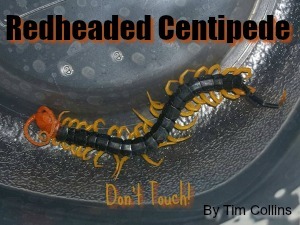 This centipede averages 6.5 inches in length but can grow up to 12 inches long. It's colorful body may attract children, but it packs a pretty powerful bite. Not only can it release venom through the fangs under their head, but also from any of the 20 pair of legs. It's not a good idea to handle this centipede, as its legs cause little cuts as it crawls across human skin--which will become severely irritated. Reactions to the bite are a sharp pain and possibly localized swelling. Where am I likely to find a redheaded centipede? Centipedes like to live in the dirt and in moist areas under logs, leaves or bark (mulch). They may be seen on porches and patios or in your garden. They may try to come indoors to get away from the heat in the summer months. If you're new to Texas, consider visiting these websites and joining these Facebook pages to become familiar with the insects in the area you live or plan to visit. A little research can save you a lot of time--and pain! Here you can read about the Medically Important Arthropods in Texas. A database of contributed photos with IDs. You'll find everything from managing fire ants to information about pesticides and insecticides. Share your photos of insects with your general location, and within minutes you'll have answers to your question, "what kind of...is this?". The knowledge of these folks and their photos were invaluable to this author during the writing of this article. There are over 11,000 members spread across the world in this group. Facebook Page: DFW What Kind of Bug is This? With over 1,400 members, this group shares geographically specific information to the DFW area. This group generously shared their knowledge and photos with this author in researching this article. A special thanks to Nathan Riggs, admin and creator of the group Facebook Page: Antman's Hill. Nathan studied Entomology at Texas A&M University-College Station. Nathan and the members provided invaluable information and contributed photos to this article, as well as provided final edits. Thank you to Carl J. Franklin, Biological Curator, Amphibian & Reptile Diversity Research Center, UTA. Carl pointed me in the right direction to resources, including the Facebook page DFW What Kind of Bug is This?. Thank you to Michael E. Merchant, Professor and Extension Urban Entomologist with Texas A&M AgriLife Extension Service who's assistance was invaluable with Africanized Honey Bees and the likelihood of spotting these Texas pests in Collin County.